Deep Urban was founded in 2006 as “The Brazen Eye” ( TheBrazenEye , www.TheBrazenEye.com ) to showcase the work of our founder, Melynda Andrews, whose children grew up in the studio and eventually took up the brush themselves. Through marriage and adoption, we added two more artists to our family and changed our name to Deep Urban Fine Art ( DeepUrban , www.DeepUrban.com ) in 2010. Our studio is located in the foothills of the beautiful Cascades mountain range southeast of Seattle, Washington, USA. We produce and sell over 350 art pieces per year, and our primary focus is and has always been strongly emotive, large-scale abstract expressionist paintings–though we are selectively adding other artists and art forms as time goes on. Our work can be successfully and meaningfully displayed anywhere. Our paintings hang everywhere from quaint European cottages to sleek, glass-and-steel showrooms. Our collectors live on tropical islands, in deserts, and in the Land of the Midnight Sun. The paintings we sell are all hand-painted originals, not prints of any kind. 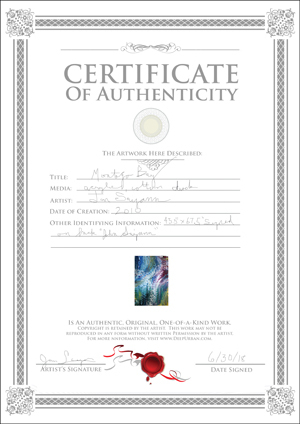 The prints of digital artworks we will be adding are all limited-editions. Our materials are designed to last generations, not a year or two. All of our art is signed on the back, and most of is signed on the front as well. 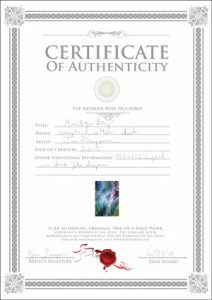 All pieces come with a COA (“Certificate of Authenticity”) like the one below and are carefully packed for safe shipping. The artists we feature are all known to us. We do not support the exploitation of workers forced to toil in some sweat-shop assembly line art mill in Who-Knows-Where. A versatile artist, Kip works in both abstract painting and figural digital media. Their abstract paintings feature bold, salient forms, high contrast, and subtly unbalanced composition. “Painting,” Kip says, “is a strange mixture of control and absolute freedom, and my work reflects that.” Beautiful and thought-provoking, their traditional paintings often reflect a deeply cerebral approach to art, while their digital work is usually more whimsical. Rain’s work reflects a highly experiential personality and often pairs understated color palettes with organic motifs, reflecting an intense appreciation of the beauty that is found in nature. “Humans,” she writes, “are driven to re-create the natural world out of unnatural materials, and that fascinates me.” Her work reflects her own personal dichotomy: a personality that is at once charismatic, dramatic, and assertive, yet reflective, introspective, and introverted. Though the majority of his work consists of photo-realistic portraiture, Lincoln’s work ranges from painting and drawing to photography and assemblage. He specializes in commissioned portraits executed in oil paint. He steadfastly denies that his work expresses any deeper meaning than its immediate aesthetic impact.